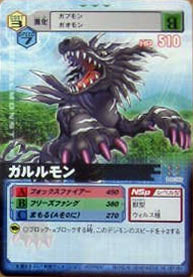 A Virus attribute Garurumon. The blades extending from its shoulders are so sharp that they slice apart anything they touch. 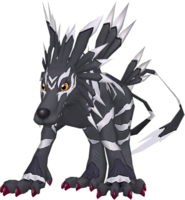 It loves collecting bones and burying them in the ground, though there appear to have been cases of these bones being quietly stolen away by prank-loving Drimogemon. Its Special Move is breathing blue, high-temperature flames from its mouth (Foxfire). 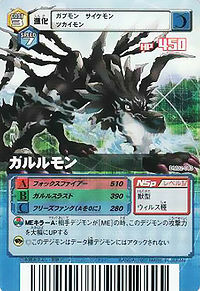 A Garurumon which evolved to become Virus attributed. 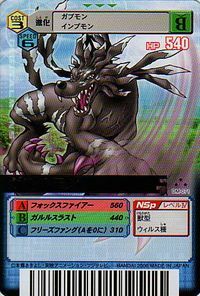 It reliably brings down any opponent it aims for, and is more ferocious compared to Vaccine or Data attribute Digimon. The blades on its shoulders cut anything they touch. 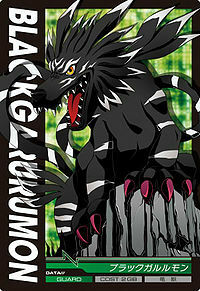 A Virus Garurumon with a black skin. That fur as hard as Mithril covers its whole body, and the carnivore-like agility allows him to hold and attack precisely its prey. | Garuru (「ガルル」) is the sound of a growl. | Garuru may stand for Loup-Garou (「ルー・ガルー」 Rū Garū), which means werewolf. Anime/Manga Digimon Savers: "The Masaru-Agumon Combo Dissolves?! 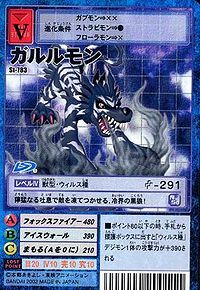 Squalling Garurumon"
Foxfire [N 1] フォックスファイアー Fokkusufaiā Fox Fire/Howling Blaster Breathes out flames. Freeze Fang  フリーズファング Furīzu Fangu Freeze Fang Bites an enemy with icy fangs. Fires balls of ice from its mouth. Wolf Cry  ウルフクライ Urufu Kurai Howling Wolf Howls a powerful shockwave. Breathes out a wall of ice to repel attacks. 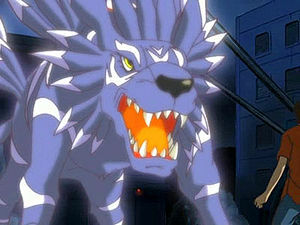 An Elecmon that realized in the vicinity of the city district evolved to Garurumon and was defeated by Geo Greymon. 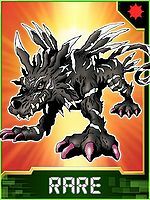 Black fur is a sign of a virus Garurumon, it won't let any prey get away. 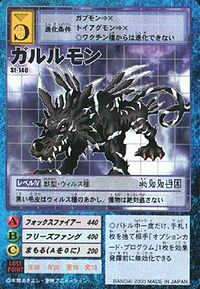 It freezes its opponents with its ferocious breath, the frigid world's black wolf! A Virus attribute Garurumon, the sharp blades that grow from its shoulders slice apart anything that touches them. 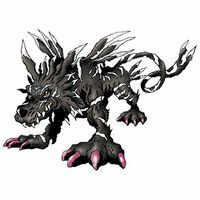 It collects bones and buries them underground, though there have been cases where those bones were taken by Drimogemon. ↑ Digimon Savers: "The Masaru-Agumon Combo Dissolves?! Squalling Garurumon"
↑ Foxfire is a bluish or greenish bioluminescence given off by certain fungi. This page was last modified on 15 April 2019, at 22:52.